There is so much to do when preparing for a wedding. You'll need to decide where the venue will be, you'll need to send out the invitations, and you'll need to choose who will be your bridesmaids. One of the most important tasks on your wedding planning checklist is choosing the dresses. The bride, of course, will need a dress, as will the bridesmaids and mother of the bride. But what about the mother of the groom? If you haven't picked out a dress for the mother of the groom, you have come to the right place. In this article, I'll go over the best mother of the groom dresses to consider using. I'll also give some tips for shopping for mother of the groom dresses. Let's get started. Traditional mother of the bride dress etiquette says that the mother of the bride should choose her dress first. Once she has chosen her dress, she should let the mother of the groom know what she'll be wearing. That way, the dresses can complement one another. When shopping through mother of the groom dresses, it is important that you shop for a dress that is the same color, style, and length of the mother of the bride and bridesmaids' dresses. However, it should not be the exact same as their dresses, but instead, it should simply be similar. Although black dresses used to be considered improper for weddings, these days, many people choose to wear black at a wedding. In fact, there are even black wedding dresses these days. A black mother of the groom dress can be worn as long as the bridesmaids and mother of the bride will be wearing something similar to it. Always make sure the bride and groom approve of the dress. Ask the bride and groom first what dress would be best. Once you choose one, let the bride and groom decide if it will work. This dress from David's Bridal is a two-piece dress designed for mothers of the groom and bride. The jacket can be taken off so that the dress has a tank-top styled top. The lace on this dress makes it elegant and beautiful. Keep in mind that this is designed for plus size women. If you don't wear plus-sized clothing, you may have to shop for dresses similar to this one from different brands. Butmoon, a professional dress factory, make high-quality, handmade dresses. While this dress is designed for the mother of the bride, it will work just as well for the mother of the groom. The company can custom make a dress for you if none of their dress sizes work for you. This dress comes in four different colors, which are Burgundy, Champagne, Mint, and Navy Blue. This dress is much cheaper than the previous mother of the bride dress and it comes in all sizes, not just plus size. It also has more color choices, as the previous dress only had two color choices. The lace top makes this dress stylish, and the ribbon belt matches the bottom skirt. Butmoon makes many other wedding dresses besides this one. They sell bridesmaid dresses and other dresses for the mother of the bride. If the Lace Applique Chiffon Long Sleeve does not work for you, be sure to check out the other dresses that this company sells. 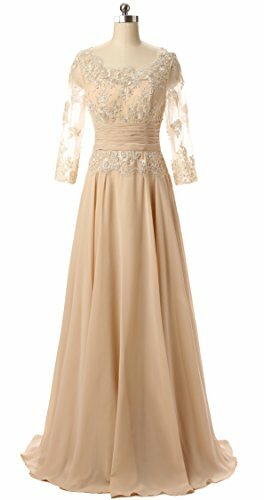 This handmade dress made of lace and chiffon is stunning and perfect for the mother of the groom. There are many different colors to choose from. In fact, as of this writing, there are 34 different colors that this dress comes in. One of the most popular colors is the silver-colored dress. The sliver-colored dress is perfect for weddings, as it isn't too bright but is still very fashionable. 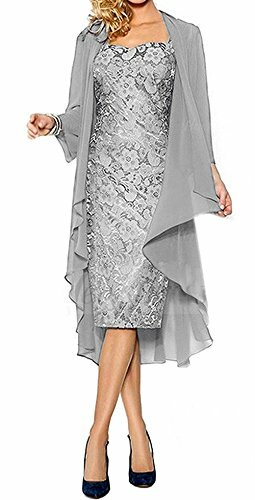 When ordering the ThaliaDress Women's Lace Straps Mother of Bride Dress with Chiffon Shawl, be sure to order it a size or two up from the size you take. Multiple customers on Amazon mentioned that this dress is small. But as long as you order it a few sizes bigger, you shouldn't have any problems. The Chiffon Shawl is removable, so you can wear this as a short-sleeved dress if desired. Overall, this is one of the best mother of the groom dresses, besides the fact that these dresses run smaller than the chart says. 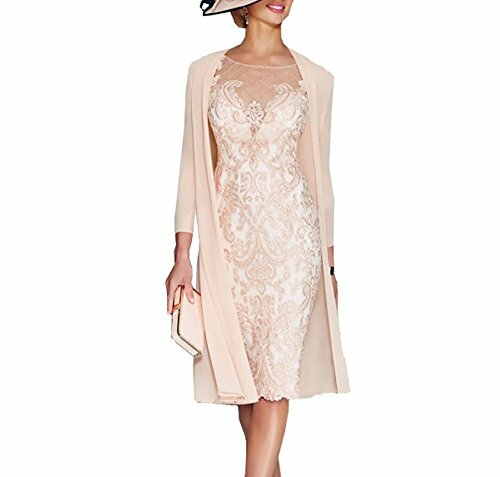 The APXPF Light Pink Women's Mother of The Groom Dresses Tea Length with Jacket comes in 15 different colors. It comes in two pieces, with the bottom piece being the lace dress, and the top piece being the jacket. The dress is long-sleeved, as is the jacket. If you cannot find a size that fits your needs, you can order a custom-made dress. Keep in mind that these dresses run on the smaller side, so you may want to order a couple sizes larger than you normally do. The price is much more expensive than many of the other mother of the groom dresses I've gone over. It is especially expensive if you purchase a custom-made dress. That said, the quality of this dress is good, and many customers were pleased with their purchase. Because of all the different color options, you are bound to find a dress that fits your needs. Overall, the APXPF Women's Mother Of the Groom Dresses Tea Length is a great dress to buy. The Floral-Embroidered Illusion Mother Of the Groom Dress comes in two colors, Champagne and Eggplant. This Ballgown silhouette is a stylish choice for any event or special occasion. It is fully lined and has a zipper in the back. To clean this dress, David's Bridal recommends to dry clean it. This dress can be used for the mother of the groom or the mother of the bride. It is the perfect style for a wedding, as well as other events. This mother of the groom dress runs on the smaller side. Be sure to order it in a size or two up from the size you normally take. Although this dress is very expensive, most customers who ordered it thought it was worth the price. The floral design makes it stylish and beautiful for a wedding. 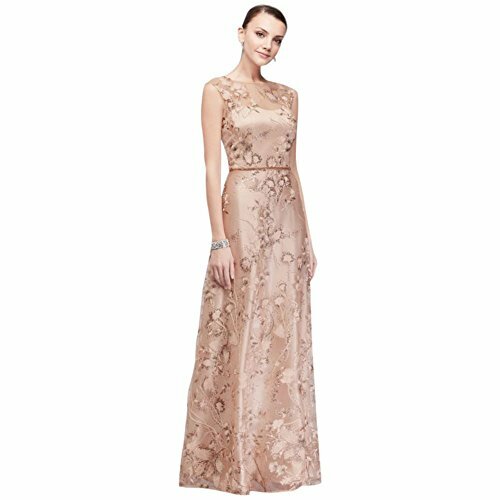 The VaniaDress Women V Neck Half Sleeveless Long Evening Dress Formal Gowns comes in 44 different colors. The sleeves come down to the shoulders and the neckline is a V-neck. It is much cheaper than many of the other mother of the groom dresses that I went over in this article. Made of soft material, you don't have to worry about this dress being uncomfortable to wear. Just like many of the previous mother of the groom dresses, the VaniaDress mother of the groom dress runs on the smaller side. Therefore, you may want to order it in a few sizes up. That said, some customers had issues with the sleeves hanging over the shoulders too much. Women who are very thin may have issues with this. Besides this issue, this dress is a perfect choice for the mother of the groom. This dress by Adrianna Papell is perfect for the mother of the bride or groom. Although it is more expensive, the floral design makes it worth the high price. The fabric is made of beaded mesh. This dress is short-sleeved and it has a crew neck. This mother of the groom dress is beautiful and elegant in many ways. While the sizing of this dress is correct, some customers had issues of it being too long. Plan on wearing this dress in high heels so that the dress doesn't get dragged. You can also hem it so that you can wear it with any shoes. All in all, this dress is perfect for the mother of the bride. Just be aware that it could be a little longer than you need it to be. I hope this article on the best mother of the groom dresses has been helpful. As you can see, there are many beautiful mother of the groom dresses to choose from. Make sure you order the correct size, as many of these dresses run on the smaller size. If you are in doubt, it is better to go a size up. Whichever dress you choose, make sure it is similar to the mother of the bride dress, and make sure it is approved by the bride and groom. I hope this article has been helpful to you. Happy shopping!